Is there any issues with this cell at the moment? The signal quality has dropped quite dramatically over the last 24 hours and I wondered if there is a known issue at the moment. Hello! I checked the area based on your customer ID and there wasn't any problems visible. Might be just a spike in usage or users in the area. Has the connection returned to the normal state or is it still persistent? It is persistant at the moment. Has there been work on another cell in the general region? I ask because the type of issue suggests alot of interference coming from somewhere. 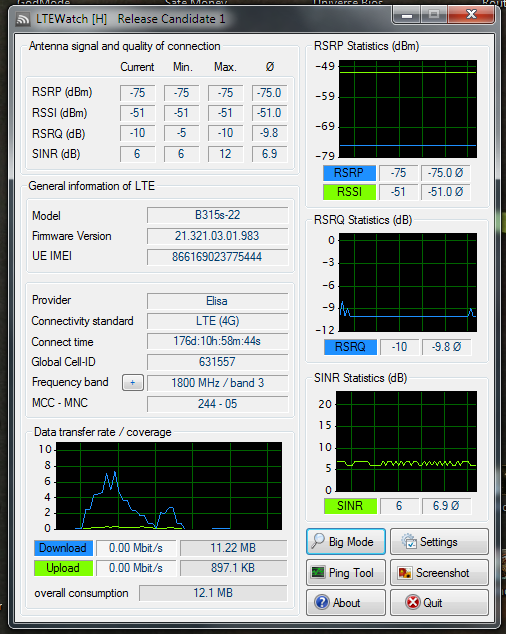 My SINR would normally be 7 minimun but its now dropping to 4 and bandwidth is reduced. The signal strengh however still reports as it was. Didn't see anything out of ordinary while checking the area Has there been increase in latency or drop in speeds or any other indications of problem? The issue I can see in the signal tests and there has been a drop in bandwidth also. While RSRP, RSSI and RSRQ are in the range I see since the 1800Mhz tower went up, SINR has had a big hit which I noticed first yesturday. Before the issue I was seeing as follows. So going from my results I see something is affecting the signal quality rather than the signal strengh. I guess that can be anything from a issue with the cell in Lemu or a cell in the surrounding area like either 733700 (which I can connect to sometimes) or 733442/733444. Here are are pictures showing whats happened to the signal quality. First picture is how it has been since the cell went live last year. This picture below is how it started acting for the past few days. 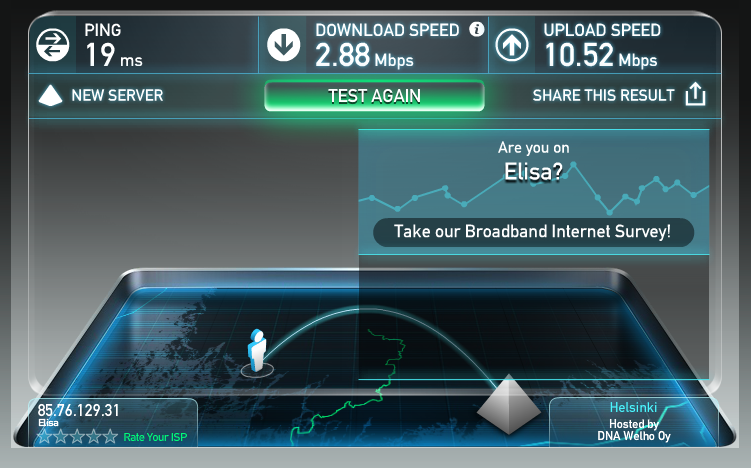 As I mentioned bandwidth has degraded also (both upload and download). Here is another picture showing my current bandwidth situation on 25/02/2018 at 11:05 AM. As you can see its well below the 5mb garanteed minimum. It is the same when I tested against different servers in Turku and Helsinki to so its not the DNA server in the picture..
Are you totally sure there is no network failure or work going on in a 15km radius around Lemu? I'm guess there is a issue with this cell as its no longer accepting connections? I have called in and reported this as a technical fault now given this cell is still not active.